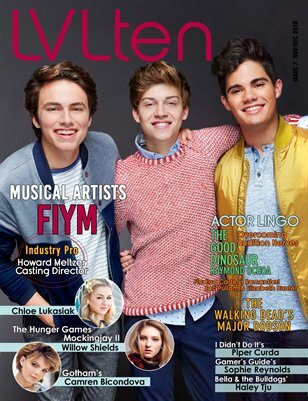 LVLten is a quarterly publication geared towards teen and young adult performers of every genre (acting, modeling, dance and music). Our Nov/Dec 2015 issue contains exclusive celebrity features (fashion editorials with exclusive interviews) with Willow Shields (Hunger Games),Musical Artists Forever In Your Mind, Gotham’s Camren Bicondova, Dance Moms Alum Chloe Lukasiak, Disney Channel’s Piper Curda, The Walking Dead’s Major Dodson, The Good Dinosaur’s Raymond Ochoa, Bella and the Bulldogs’ Haley Tju, Disney XD’s Sophie Reynolds and more! Exclusive Industry Pro interview with Casting Director Howard Meltzer PLUS articles on Overcoming Audition Nerves, How To Find the Right Headshot Photographer and Lingo every actor should know before stepping on set!